One color postcard with a divided back. 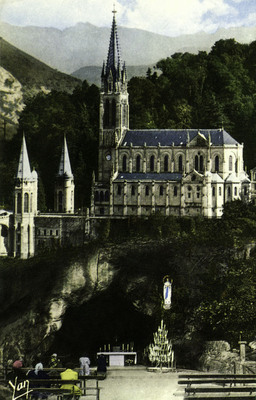 The postcard was published by Yan-Rogé at 6, rue de l'Hôtel-de-ville of Lourdes, France. Greetings from Lourdes! This is a very hallow and sacred spot. You were remembered especially. The picture does not do justice to it. The Cathedrals, Grotto, Crypt, Stations, Processions, [illegible] is indescribable. Sr. M.T.